The feast of Saint Andrew the First–Called marks the threshold of the new liturgical year with the sign of the Cross. We are accustomed to thinking of the Cross in the context of Lent and Paschaltide. The advent of the Lord is, nonetheless, entirely illumined by the mystery of the Cross. An ancient responsory says, “This sign of the Cross shall be in heaven when the Lord comes to judge. Then shall the secrets of our hearts be made manifest” (Office of May 3rd, Invention of the Holy Cross). By showing us the Cross today, the liturgy points through Advent to Christ’s passion, resurrection, and second coming. The whole economy of salvation bears the luminous imprint of the Cross. The liturgy calls Saint Andrew “the good teacher and the friend of God” (Responsory). Saint Andrew is a good teacher because he preached the wisdom of God in the word of the Cross (cf. 1 Cor 1:18, 24). Saint Andrew is the friend of God because the wood of his cross bound him to Christ our God in an everlasting friendship, even as Christ Himself was bound to the Father and made over to Him once and for all by the sacrifice of the Cross. The Apostle Andrew does not mislead us with the “artificial sweeteners” of so many religious teachers, nor does he fill our minds with a preaching “emptied of its power” (1 Cor 1:17). In the end, Saint Andrew preached the cross by embracing it, and by stretching His body over its four arms. The liturgy sings that “When Andrew saw the cross, he cried, saying, ‘How wonderful art thou, O cross! O cross, how lovable art thou! O cross, thy bright beams enlighten the darkness of the whole world! Welcome a follower of Jesus, that, as by thee He died to redeem me, so by thee also He may take me unto Himself” (Responsory). Saint Andrew’s cross was not that of his Master in its form. 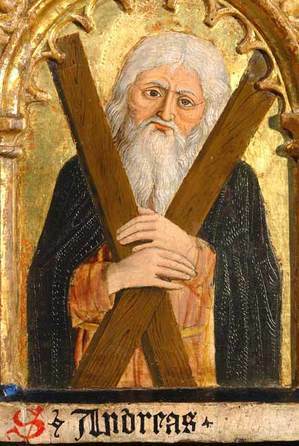 Tradition is that Saint Andrew was put to death on an X-shaped cross. Though outwardly different from the cross of Jesus, Saint Andrew’s cross became for him a sacrament of communion with Our Lord, a means of passing to the Father in the power of the Holy Ghost. Yesterday a single movement ran through the whole liturgy: out of self, and upward into the fullness of God. “Ad te levavi animam meam. . . . All my heart goes out to You, my God” (Ps 24:1). Today we see in Saint Andrew just how this movement is accomplished: through the Cross. Outwardly our crosses do not have the form of the Cross of Jesus. Faith, however, sees in them a means of passing from ourselves to God. The cross of illness can be a means of passing over to God, provided that it is recognized and accepted as such. The crosses of weakness, of failure, of loneliness, depression, and loss can be for us sacraments of an encounter with God. The Cross allows us to experience God as the redeemer of all our failures, the companion of the lonely, the comforter of the depressed, the treasure of those who suffer loss. Apart from the Cross there is no way of knowing the healing mercy of God, no way tasting the sweetness of His love in bitterness, nor of passing out of darkness into His wonderful light. In the Antiphon that will be sung in today’s Office, Saint Andrew sings to the Cross, something that, apart from a special grace of God, we are incapable of doing. “I come to thee in peace and gladness.” More often than not we come to our crosses in fear and heaviness of heart. Far from singing to them we approach them murmuring, or in the sullen silence of our unspoken resistances and inability to trust. Saint Andrew was able to sing a greeting to his cross; he was able to come to it in peace and gladness, because he recognized that by means of it he would pass over to God.